Portable, fast, accurate hardness gauge available in several models for testing materials such as aluminum, brass, copper and mild steel. Quickly identify tempers. Tests a variety of shapes that other testers cannot check: Extrusions, Tubing and Flat Stock. Easy-to-read dial indicator with 20 graduations converts to standard hardness scale, or can be used as "go" and "no-go" gauge. 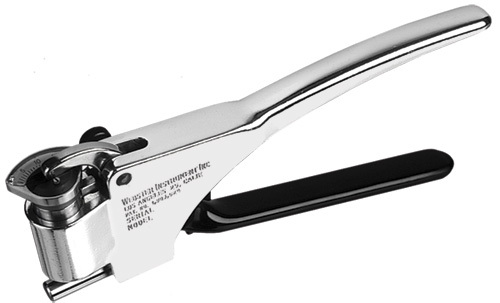 The Model B-75 Tester was developed to obtain more sensitive response to slight changes in the upper range of hardness covered by the Model B. This sensitivity is particularly useful in testing mild steel and the stronger aluminum alloys. For brass the B-75 covers the range from annealed to full-hard. This added sensitivity is accomplished by incorporating a penetrator of slightly different contour and a heavier load spring than used in the Model B. The 20 graduations on the Webster dial indicator covers the range between 20 and 100 on the Rockwell B Scale. The Model BB-75 Tester was developed to answer the need of certain industries for a method of rapidly testing the hardness of electro-deposited copper and copper in the low hardness range. The B-75 penetrator is used to give sensitivity and the Model B load spring is employed to give light pressures. This combination allows the user to test the soft range of many common materials. This sectional view shows the basic design principle of the Webster Hardness Tester. The different models vary only in penetrator and load spring design. These combinations give the ability to test a wide range of hardnesses and metals. The penetrator housing, which contains the penetrator and load spring, slides vertically in the frame of the tester when pressure is applied to the handles. Only sufficient pressure is needed to "bottom" the lower face of the housing against the work. Resistance of the work to the penetrator causes the penetrator to recede into the housing against the spring pressure. The degree of penetration on the test specimen is indicated on the dial indicator sitting on top of the housing assembly. The load can be varied by adjusting the nut above the load spring, permitting the dial reading to be easily corrected against a test block of known hardness. A penetration of .010 inch produces a full scale reading on the dial indicator. Therefore materials in the softer hardness range should be of sufficient thickness so that the anvil will not influence the test and produce an "anvil effect". In general, soft materials under .025 - .030 in thickness will not give true readings.